Employees whose contracts have been violated by their employer can resign on the grounds of constructive dismissal with this sample letter. At the recommendation of my attorney, I am hereby tendering my resignation, effective (date), due to constructive dismissal. When I accepted the position of (position) on (date), I signed a contract stating that my (salary/hours/responsibilities) were to be (amount/detail). On (date), I was (demoted/asked to work longer hours/not paid). This is a repudiatory breach of contract, which I do not accept. Due to this breach, it is my understanding that our contract has now reached its end. 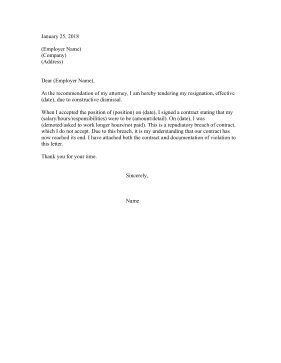 I have attached both the contract and documentation of violation to this letter.